Preventative maintenance consulting services including inspection of thermal oxidation technologies such as electrical & mechanical inspections inside & outside of each piece of equipment. Other services include engineering, rebuilding, installation & consulting. Thermal remediation involves introducing hydrocarbon contaminated soils into a heated vessel and retaining those soils until they reach a uniform temperature. The operating temperatures are limited to less than 800F, due to the potential for releasing dioxins into the atmosphere. Most of these systems utilize a method whereby hydrocarbons are vaporized and ignited. Any remaining byproducts are removed from the system by convection and treated by filters, or re-ignition in a second stage. 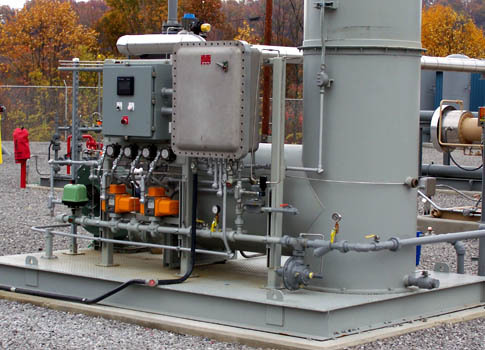 Thermal remediation systems are fueled by diesel oil or natural gas. The amount of fuel required varies with the size of the unit, but units operating in Alaska consume up to 200GPH of diesel and 1,465CUFT/HR of natural gas. These units, even in their most mobile form, are not easily moved, comprising several truck loads of equipment. The cost of these units is considerable. Units of up to 15TPH (10CYDS/HR) have prices in excess of $400,000 . Units of up to 25TPH (16.67CYDs/HR) run in excess of $1million . Given rising fuel costs and increased taxes on fuels, the cost of operation of a thermal system will increase, not decrease. The drawbacks of this type of soil remediation are many. The lighter solids particles treated tend to separate from the overall fraction being processed and get carried out by the convection system designed to remove any remaining hydrocarbon vapors. These hot dust particles create a "vagrant" dust problem, as well as a potential explosion hazard. In association with this problem, heavily saturated soils have to be diluted with clean soils , as too great a concentration of fuels will cause detonation in the combustion chamber causing superheated air to escape into the bag houses designed to contain the vagrant dust problem. The Bag Houses are known to suffer ignition hazards. Most regulatory environments involve a permitting system requiring up to a year for acceptance for the installation and utilization of a thermal remediation system. This means a fixed site facility in most states. This method is coming under increasing attack through criticism of the degradation of the ambient air quality where they are utilized. In many areas of the U.S., this method is banned outright, or severely restricted as to when it can be utilized as a result of inversions caused by weather conditions. There are studies underway in Congress which may lead to the banning of thermal remediation processes altogether, because of suspected contributions through their emissions to the worsening of the "green house" effect. Please note that thermal remediation is not effective where heavy metals are present. In a thermal oxidizer, the VOC-laden air stream is heated to gas temperatures several hundred degrees Fahrenheit above the autoignition temperatures of the organic compounds that need to be oxidized. Due to these very high temperatures, thermal oxidizers have refractory-lined combustion chambers (also called fume incinerators), which increase their weight and size considerably. A sketch of a thermal oxidizer is shown in Figure 1. The VOC-laden gas stream is held at this temperature for residence times ranging from a fraction of a second to more than two seconds. Temperatures of the exhaust gas from the refractory-lined combustion chambers are often 1,000 to 2,000°F. Thermal oxidizers usually provide VOC destruction efficiencies that exceed 95% and often exceed 99%. One of the main limitations of thermal oxidizers is the large amount of fuel required to heat the gas stream to the temperature necessary for high-efficiency VOC destruction. Heat exchangers are used to recover some of this heat. The heat exchanger shown in Figure 1 is sometimes called a recuperative heat exchanger . This type of heat exchanger has a heat recovery efficiency ranging from 30 to 60% depending on the size of the unit. Some types of thermal oxidizers use large regenerative beds for heat exchange. These beds have heat recovery efficiencies up to 95%. Due to the amount of heat that can be recovered and returned to the inlet gas stream, these units, termed regenerative thermal oxidizers (RTOs) require less fuel to maintain the combustion chamber at the necessary temperature. Thermal oxidizers have the broadest applicability of all the VOC control devices. They can be used for almost any VOC compound. Thermal oxidizers can also be used for gas streams having VOC concentrations at the very low concentration range of less than 10 ppm up to the very high concentrations approaching 10,000 ppm. Thermal oxidizers are rarely used on gas streams having VOC concentrations exceeding approximately 25% of the lower explosive limit (LEL) . This limit is imposed by safety constraints due to the possibility that a short-term concentration spike would exceed the LEL, and the gas stream would explode. The 25% LEL limit depends on the actual gas constituents and usually is in the 10,000 to 20,000 ppm range. Thermal oxidizers handling VOC materials that contain chlorine, fluorine, or bromine atoms generate HCl, Cl 2 , HF, and HBr as additional reaction products during oxidation. A gaseous absorber (scrubber) is used as part of the air pollution control system to collect these contaminants prior to gas stream release to the atmosphere.